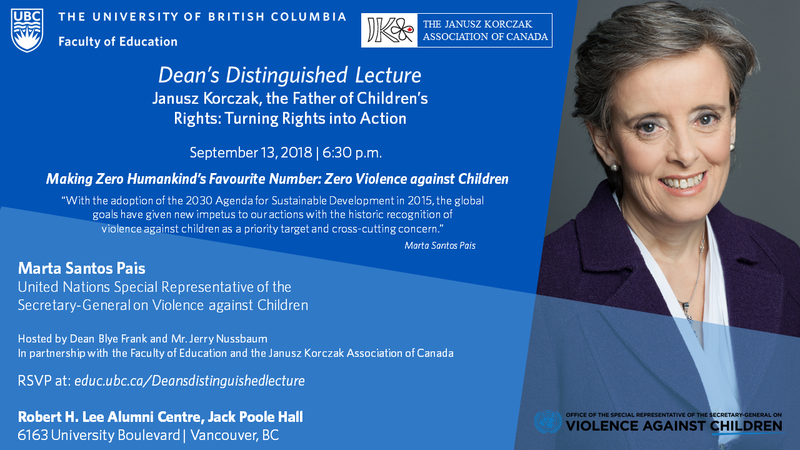 The Faculty of Education and the Janusz Korczak Association of Canada are pleased to announce the Dean’s Distinguished Lecture. Marta Santos Pais was first appointed to her position as the Special Representative of the United Nations Secretary-General on Violence against Children in 2009. As a high level global independent advocate, Marta Santos Pais promotes the prevention and elimination of all forms of violence against children in the justice setting, in the home, in institutional care, in schools, in the workplace and in the community. She acts as a bridge builder in all regions, and across sectors and settings where violence against children may occur. Since her appointment, she has been strongly committed to mobilizing action and political support to maintain momentum around this agenda and to achieve steady progress across the world. Marta Santos Pais has more than 30 years experience on human rights issues, engagement in United Nations and intergovernmental processes. During the event, Marta Santos Pais will be awarded the Janusz Korczak Statuette Award in recognition of Caring for Children in the Spirit of Dr. Korczak. During the evening, The Janusz Korczak Scholarship Certificate will be presented to the 2018 candidate. Please register for the event below. Space is limited.